To link the Omaha and Utah forces the capture of Carentan was essential. It’s northern side buildings are seen to the bottom. The low land was under three feet of water in June 1944. Colonel Robert Cole’s 3rd Battalion of the 502nd Regiment moved south from Deadman’s Corner, seen at the top right, on D-day+ 4. 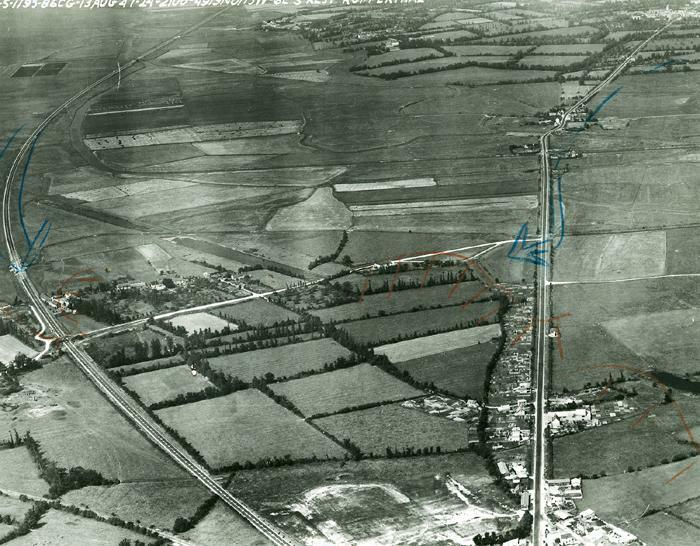 The German 6th Parachute Regiment had withdrawn along the elevated railroad line, seen on the left side, and deployed at the farm and along the road connecting the highway and the railroad. Snipers hidden in the marshes flanking the highway picked off Cole’s men moving south. By dawn the following day Cole and 265 men were at the south end of the causeway. They launched a bayonet attack westward along the connecting road axis clearing out the farm and orchards and then moved to the railroad overpass. The few remaining German paratroopers withdrew into Carentan.